After a busy weekend at CNES in Toulouse, Rosetta mission managers have chosen Philae’s landing site: on 11 November, if all goes according to plan, Europe’s lander module will touch down at Site J, located on the ‘head’ of comet 67P. Location of Site J on the comet’s ‘head’ selected as the primary landing site for Philae on the nucleus of 67P on 11 November. Credits: ESA/Rosetta/MPS for OSIRIS Team MPS/UPD/LAM/IAA/SSO/INTA/UPM/DASP/IDA. With the Sun shining brightly overhead, the atmosphere this weekend in the meeting rooms and corridors of the Poincaré building at CNES’s Toulouse Space Centre is studious.Some 70 scientists from all over Europe and the United States are poring over documents detailing the five potential landing sites downselected for Philae. They all know the sites well, as 3 weeks ago they met in the same place to establish a shortlist in light of the first data collected by Rosetta’s instruments since the spacecraft’s arrival in the vicinity of comet 67P at the start of August. 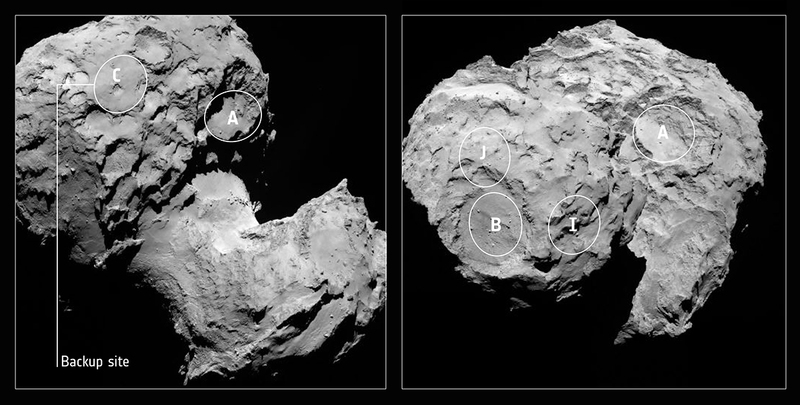 Rosetta’s attention has since focused on the 5 shortlisted sites named A, B, C, I and J to gather as much data about them in the shortest time possible. The weeks now seem to be flying by in the run-up to 11 November, the date planned for Philae’s landing, which is expected to be confirmed by ESA on 26 September. Although not highly active right now, the nucleus is active enough to remind us that could change at any time and complicate things for the mission. While teams continue to comb through the data, comparing sites and checking and re-checking calculations, many areas of uncertainty still remain that are bound to have a bearing on the final choice of landing site. Nobody says so openly, but everyone senses that history is in the making.Choosing the site to land a man-made module on the nucleus of a comet—something that quite simply has never been done before—is no mean task. Even the seasoned space professionals at NASA have never attempted such a landing. U.S. probes have brushed past comets, retrieved samples from their tail and fired a projectile into them, but no space agency has yet dared to touch down on the surface of an active comet nucleus. 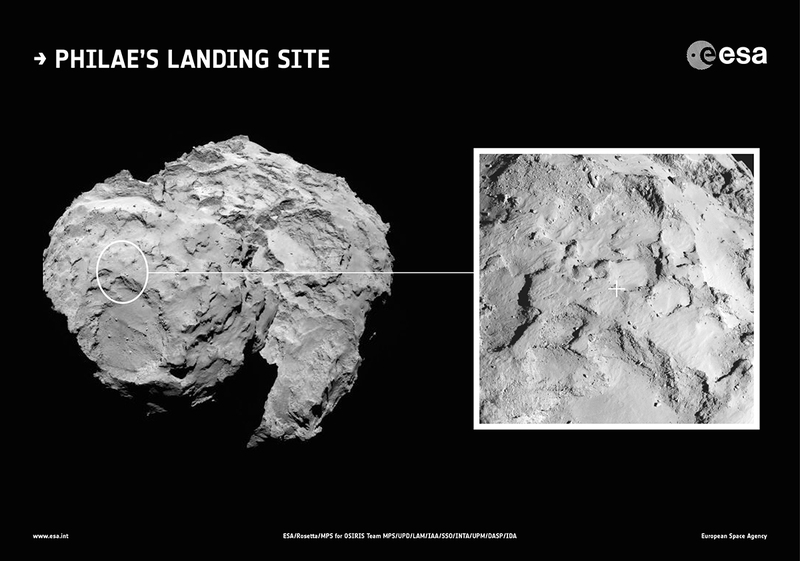 All day Saturday 13 September, the 5 landing sites are reviewed in close detail.One after the other, they are analysed using high-resolution images from the OSIRIS-NAC camera, some of them showing detail fine enough to distinguish and count boulders less than 1 m across on the surface that could cause Philae to tip over. 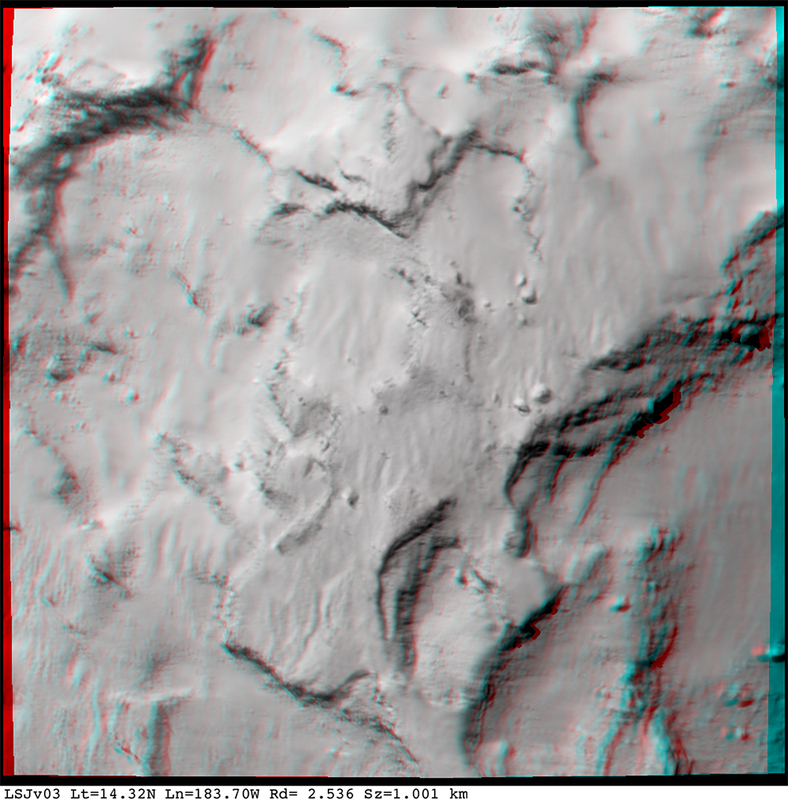 Using pairs of images acquired by OSIRIS-NAC, the scientists also generate anaglyphs to get a clearer picture of local relief. 3D physical models are passed around for everyone to ‘touch’ the surface and ‘handle’ the nucleus. Each person present had previously honed their arguments for and against each site. Do the strategies for deploying Philae drawn up at the Science Operations and Navigation Centre (SONC) at CNES in Toulouse make it possible to land safely and at an impact speed that the lander will be able to withstand? Is the daylight/night-time balance compatible with all of Philae’s instruments? Will the solar illumination of each site in the weeks after the landing and as the comet approaches the Sun be sufficient for Philae’s solar panels to properly recharge its secondary batteries so that the instruments can operate for as long as possible and ensure maximum science return? Will the frequency of communications passes between the lander and orbiter be sufficient? By Saturday evening, it was apparent to everyone that Site J was the best trade-off between all of the scientific and technological criteria, even though it was not the best for each individual criterion. So it was no surprise on Sunday morning when J was chosen as the primary landing site. For Stephan Ulamec, Philae Lander Manager at the DLR German Aerospace Centre: “As we have seen from recent close-up images, the comet is a beautiful but dramatic world—it is scientifically exciting, but its shape makes it operationally challenging. None of the candidate landing sites met all of the operational criteria at the 100% level, but Site J is clearly the best solution." The terrain in the area of 1 sq.km centred on Site J is mostly sloped less than 30 degrees relative to the local vertical, which is vital to avoid the risk of Philae tipping over on landing. In addition, the scientists who have counted the boulders of all sizes at the candidate sites estimate there are relatively fewer at Site J. And the daylight/night-time balance and solar illumination profile are good enough to recharge the secondary batteries. 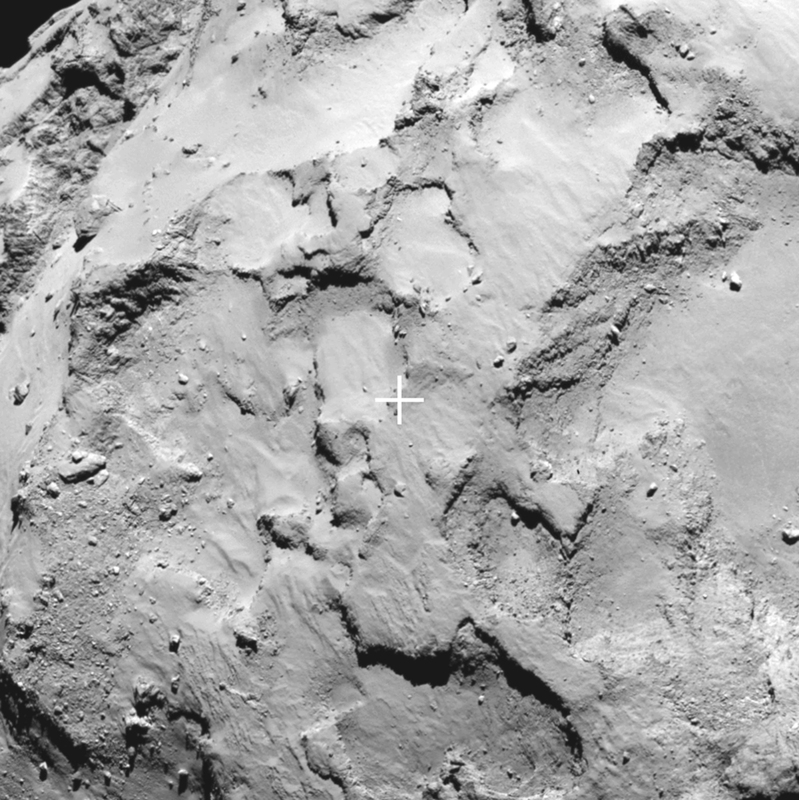 Navigation calculations also show that Philae’s descent should last approximately 7 hours. This means the lander will not use up too much of its primary battery during descent, so all of the instruments will be able to function at least once on the surface. With this scenario, Philae will land at a speed of 0.95 m/s (3.4 km/h), well within its structural strength limits. Provided closer investigations to be conducted in the weeks ahead by Rosetta’s instruments do not turn up any major showstoppers, and if the comet’s activity does not increase dramatically, Europe’s lander will therefore attempt to touch down on the small ‘head’ of the nucleus of comet 67P/Churyumov-Gerasimenko on 11 November. Location of landing sites shortlisted end August. Credits: ESA/Rosetta/MPS for OSIRIS Team MPS/UPD/LAM/IAA/SSO/INTA/UPM/DASP/IDA. But the scientists gathered this weekend in Toulouse also had to choose a back-up landing site for Philae should a hereto unforeseen obstacle arise. While choosing J as the primary site was easy, finding a back-up site proved a lot trickier. Sites A and I were quickly eliminated. Although they initially seemed to have good potential, they didn’t satisfy a number of key criteria. By the end of Saturday, the scientists had therefore narrowed the field down to sites B and C.
In the final analysis, Philae mission managers went for Site C, as it offers a better illumination profile and seems to have fewer potentially dangerous boulders. The scientists nevertheless voiced doubts about the navigation strategy for reaching Site C, which depends on using a mechanical deployment system that has been stowed away for more than 10 years and therefore might not work exactly as expected when it comes to the crunch. If it doesn’t release, the back-up pyrotechnic system will automatically fire and it will be impossible to slow Philae sufficiently to reach Site C. Noting these doubts, DLR’s Stephan Ulamec however stressed there was no reason to believe the deployment system will not function nominally when needed. He was supported by Hermann Böhnhardt for MPS, responsible for the separation subsystem. Another more unfortunate point raised by the scientists concerning Site C is the fact that radar sounding of the nucleus by the CONSERT instrument would be greatly compromised. Wlodek Kofman from the IPAG planetology and astrophysics institute in Grenoble, the Principal Investigator for this instrument, summed up the situation tersely: “if you go for C, we’re out!” But he qualified his statement somewhat shortly afterwards, saying that measurements could be acquired if ESA agrees to fly a number of trajectories specially designed to allow the CONSERT instruments on Rosetta and Philae to sound the nucleus correctly. Close-up of back-up Site C; image taken 70 km from the nucleus with a resolution of 1.5 m/pixel. Credits: ESA/Rosetta/MPS for OSIRIS Team MPS/UPD/LAM/IAA/SSO/INTA/UPM/DASP/IDA.